I hope everyone had a great long weekend this past Memorial Day Weekend. As always, be sure to start your workdays with #ThatBusinessShow airing weekdays at 8am on 1250WHNZ and you can watch us live in studio via the live stream link at http://www.tampabayradio.com and also listen anywhere in the world on your smartphone via the iHeart Media app. On the first half of the show, I welcomed back in studio Ron Klein. 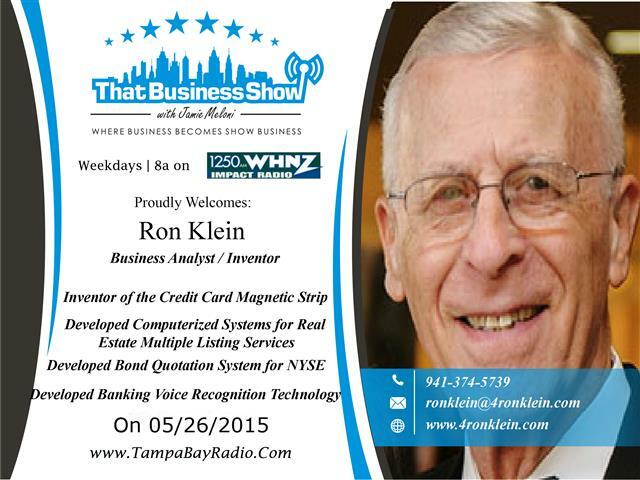 Ron Klein was my guest on the inaugural #ThatBusinessShow and was such an impressive guest that I wanted to speak with him again on the show. He is responsible for a number of revolutionary inventions including the Magnetic Strip on the back of credit cards as well as developed the first Multiple Listing Services for Realtors. In addition, he developed the Bond Quotation and Trade Information Systems that the New York Stock Exchange use. He is a true entrepreneur with only one failure he admitted to today – Retirement. Still at the age of 80 he is going strong and just can’t keep away from innovative ideas that the market needs. Today he talked about his latest invention that is just about to hit the market which is designed to assist the visually impaired by labeling items around their homes that can be ready via an app on a smartphone. The invention is a simple label maker that encodes the name of the item and your smartphone reads the name that is on the item. This is an excellent resource for things such as medicines and spices and other commonly used items around the home that come in similar containers. Check out the site http://www.meeteli.com for a demonstration of this product and learn more about Ron at his website http://www.4ronklein.com! On the 2nd half of the show, I welcomed Jamie Harden in studio. 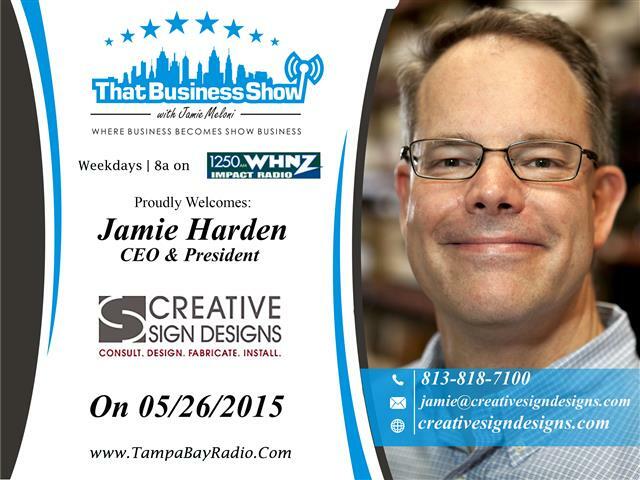 Jamie is the President and CEO of Creative Sign Designs which is now one of the fastest growing architectural sign companies in the United States. Today the company employs more than 140 peoples throughout Florida and is based here in Tampa. Jamie explains on this segment about his path to entrepreneurship that arose following a successful career in the banking industry but one that left him wanting more challenge, freedom and opportunity and led to Creative Sign Designs. He also operates Creative Mailbox & Sign Designs and is the largest turnkey residential streetscape company in the Southeastern United States. CMSD provides mailboxes, street signage and monument signage to builders, property management firms and homeowner’s associations. Jamie speaks about their commitment to quality and the environment on this segment as well as takes us through the design and installation process that clients can expect when utilizing their services. Specializing in large scale and challenging sign products, Jamie invites you to contact him today to discuss your next sign project. He can be reached at 813-818-7100 or email at Jamie@creativesigndesigns.com and learn more at http://www.creativesigndesigns.com!